The speech Enhancement Device reduce the fatigue of fortigue of forced speech, thereby enables the speaker to be heard in moderately noisy situations like wedding ceremonies, functions, office atmosphere, market places, court rooms, class rooms (of school and colleges for teachers), business, houses, factories or in moving vehicles / trains etc. etc. The battery chamber is easily accessible for accessible for smooth battery replacement. The head set is light weight and is supplied with a built in microphone. The head set allows hand free operation without any discomfort of holding mike with one hand. 1. Place the headset over the head in such a manner that the mike is nearest to the lips. 3. Place the main instrument unit over table or hang it with belt or wear it in the neck with face of its speaker towards the listeners. 5. Do not place hand or any obstruction out side the speaker of the main unit. 6. Put the main unit switch to ‘ON’ position when talking and to ‘Off’ position when not in use to avoid battery consumption. Price : Rs. 2000/- with headset. Rs. 500/- without head set. · Subject to change without any pre notice. We are pleased to introduce the updated and New “Electro-Larynx Instrument” after extensive consultation with leading speech Pathologists on the needs of Laryngectomees. Works on ordinary / rechargeable 9 volt battery easily available worldwide. Facility to energise through an Ac battery adopter. Electro-Larynx, a single compact unit, offers effortless operation with ease of maintenance at minimum cost. Saving in battery consumption is achived by energizing it through the AC Battery adopter. Separate ‘volume’ and ‘pitch’ controls offer the user a wide range of volume and pitch of the voice, as needed. Electro-Larynx produces electronically generated vibrations, transmitted to the mouth of the user who modifies these vibrations into recognizables speech through movement of the tongue and lips. Therefore, a speech training course , for a very short period, is generally recommended to enable the user to achive satisfactory ability to communicate with Electro-larynx. Steam Inhaler is an electric appliance, which enables the user to inhale steam (hot water vapours) thereby providing relief in the nasal congestion, chest congestion and crystal formation of mucus. Steam vapours are also useful for getting the complexion of the skin cleaned. Strong Plastic Body – total protection against suspected electric shock. Quick vapourisation of water due to immediate boiling of water within 25 seconds. Easy to hold, easy to plsce and easy to use. 1. 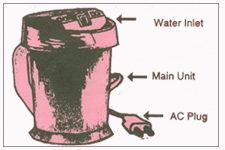 Pour water mug through the water inlet of the main unit upto the maximum water level indicated over the body of the unit. 2. Do not try to open the main unit. 3. Place the plastic flask over the main unit. 4. Place both the units together over table/small stool and connect with electricity. 5. After about 15-20 seconds, hot water vapours would be visible over the top of the plastic flask. 7. Place the big towel over the entire area around the unit and and to avoid spreading out of hot water vapours. 8. Shut off the electricity connection when water vapours are too hot. 9. Take deep breath inhaling the hot water vapours. 10. It is not essential to mix ‘vicks’ in water, as simple hot water vapours are equally effective. Packing & Postage Rs. 75/- extra.